Media and Contents: Soft cover, 80 pages plus Matilda tank color camouflage guide. Advantages: Wide selection of modelling projects, subjects, scales and colours; high quality photography including some spectacular composite images; useful and descriptive text; includes profiles and reference photos. The Matilda Infantry Tank was a vitally important vehicle to Allied forces in the early years of the Second World War. It participated in the Battle of France, and is probably best known as a well-armoured adversary to the German Panzers in North Africa. However, it is worth remembering that the Matilda was also used widely by Australian forces in the Pacific and even on the Eastern Front by the Soviet Army. With its broad service history and associated camouflage and markings, the Matilda is certainly a worthwhile modelling subject. Canadian modeller Mark Bannerman has put together a bulging package of modelling material for this newest title in the Osprey Modelling series. Mark commences with a few paragraphs of history and a description of tools required for the forthcoming projects. The next chapters cover three small-scale Matildas - a 1/76 scale Cromwell kit of the Matilda Mark I, A11, in resin; Fujimi's 1/76 scale Matilda Mk.III and ESCI's 1/72 scale Matilda. It is pleasing the see the Mark I A11 Matilda covered, as it is an important and immediate ancestor to the bigger and more familiar Matilda A12. This first project is finished in BEF markings during 1940. The Fujimi Matilda Mk. III is depicted as a vehicle on Malta during 1942, and is painted in an intricate sandstone block camouflage pattern. The final small scale project is a desert Matilda. All three small scale models are built straight from the box, and are very nicely painted and photographed. Five 1/35 scale modelling projects are next. Tamiya;s 1/35 scale kit is the only game in town in this scale, but plenty of variety is obtained. Mark Bannerman's modelling centrepiece is his 1/35 scale Matilda Mk.IV "Frog" conversion. The Matilda Frog was an Australian flamethrower conversion used against Japanese fortifications and tunnels in the Pacific theatre. The modelling article and additional references take up 19 pages of the publication. Construction is lavishly covered in words, pictures and diagrams. This is an extensive conversion and it is extremely well done. Indeed, I found this particular model so inspiring that I immediately ordered several the resin Matilda Frog conversion as used in Mark's article (plus a few others!) from MR Models. Some of the composite photos of the completed Matilda Frog, including the main cover image, are some of the most impressive that I have seen. The next project shows extensive detailing and scratchuilding, followed by Steve Zaloga's early A12 Matilda in France, 1940. The standard of modelling on both these models is also excellent. A further Matilda Mk.III in desert colours is included in a short Chapter, followed by an interesting conversion to a 50mm self-propelled gun in German service. The book is rounded out with a list of Museum examples and references, and a page of colours typically worn by the Matilda tank. 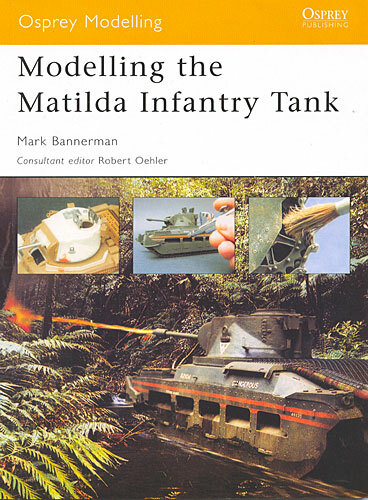 I found Osprey's "Modelling the Matilda Infantry Tank" to be inspiring and entertaining. This title will be of great interest to modellers of Allied vehicles whether you work in small scale or in 1/35.